(5) The above copyright notice appears on all copies. All Information on this website is protected by copyright laws and except as permitted above, no license or right, express or implied, is granted to any person under any patent, trademark or other proprietary right of DIPA HEALTHCARE. The use or misuse of these trademarks or any other materials, except as permitted herein, is expressly prohibited and may be in violation of copyright law, trademark law, the law of slander and libel, and other regulations. Please be advised that DIPA HEALTHCARE actively and aggressively enforces its intellectual property rights to the fullest extent of the law. This website may provide links or references to other websites but DIPA HEALTHCARE neither control nor endorse such other websites, nor has reviewed or approved any content on the other websites thus have no responsibility for the content of such other sites and shall not be liable for any damages or injury arising from that content. Any links to other sites are provided as merely a convenience to the users of this website and you expressly agree that your use of other websites is at your sole risk. DIPA HEALTHCARE will use reasonable efforts to include up-to-date and accurate information in this website, but make no representations, warranties, or assurances as to the accuracy, currency, or completeness of the information provided. DIPA HEALTHCARE shall not be liable for any damages or injury resulting from your access to, or inability to access, this website, or from your reliance on any information provided at the website as each person assumes full responsibility and all risk arising from use of the website. The Information is presented “AS IS” and may include technical inaccuracies or typographicalerrors. DIPA HEALTHCARE reserves the right to make addition, deletions or modifications to the Information at any time without any prior notification. This website may provide links or references to other websites but DIPA HEALTHCARE neither control nor endorse such other websites, nor has reviewed or approved any content on the other websites thus have no responsibility for the content of such other sites and shall not be liable for any damages or injury arising from that content. Any links to other sites are provided as merely a convenience to the users of this website and you expressly agree that your use of other websites is at your sole risk. DIPA HEALTHCARE claims no ownership in, nor any affiliation with, any third-party trademarks appearing on the website. Such third-party trademarks are used only to identify the products and services of their respective owners, and no sponsorship or endorsement on the part of DIPA HEALTHCARE should be inferred from the use of these marks. The website may contain general information relating to various medical conditions and their treatment. Such information is provided for informational purposes only and is not meant to be a substitute for advice provided by a doctor or other qualified health care professional. You should not use the information contained herein for diagnosing a health or fitness problem or disease. You should always consult with a doctor or other health care professional for medical advice or information about diagnosis and treatment. Communications from users or other material sent through the internet, posted on a DIPA HEALTHCARE Website are deemed to be non-confidential and non-proprietary, and DIPA HEALTHCARE shall have no obligation of any kind with respect to such information. DIPA HEALTHCARE shall be free to use this information (including any ideas, inventions, concepts, techniques or know-how disclosed therein) for any purpose it deems appropriate, including but not limited to reproduction, publication and commercial purposes, without paying users for the right to do so. 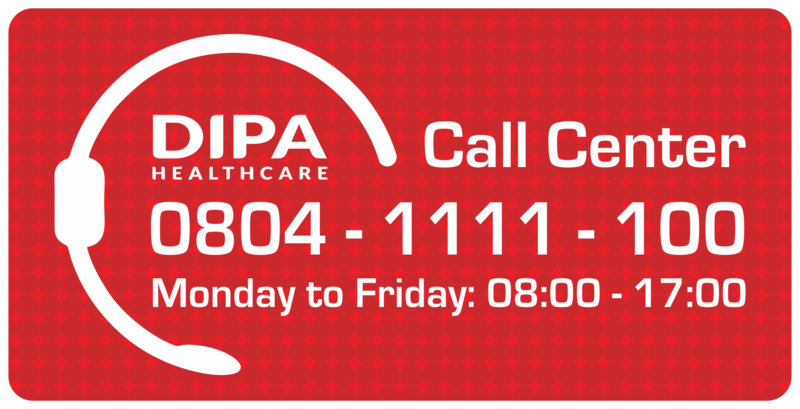 The sender of any communications to DIPA HEALTHCARE website or otherwise to the owners of this website shall be responsible for the content and information contained therein, including its truthfulness, accuracy and that appropriate consent (if so required) are obtained prior to the submission of any information to DIPA HEALTHCARE website. The service and information available on the website are intent for people over 18 years of age. You agree to indemnify, defend and hold harmless DIPA HEALTHCARE, its officers, directors, employees, agents, suppliers and third party partners from and against all losses, expenses, damages and costs, including reasonable attorneys' fees, resulting from any violation by you of these Disclaimer Notice. This website and its contents are intended to comply with the laws and regulations in the Indonesia. Although the information on this website is accessible to users outside of the Indonesia., the information pertaining to DIPA HEALTHCARE’s products is intended for use only by residents of the Indonesia. Other countries may have laws, regulatory requirements and medical practices that differ from those in the Indonesia. DIPA HEALTHCARE reserves the right to limit provision of its products or services to any person, geographic region or jurisdiction and/or to limit the quantities or any products or services we provide. Any offer for any product or service made on this website is void where prohibited. We reserve the right to disclose your personal information as required by law, when we believe disclosure is necessary to comply with a regulatory requirement, judicial proceeding, court order, or legal process served on us, or to protect the safety, rights, or property of our customers, the public or DIPA HEALTHCARE. This website and your use of the website shall be governed and interpreted in accordance by the laws of the Indonesia without regard to its conflicts of laws principles. Any legal action or proceeding related to this website shall be brought exclusively in a court of competent jurisdiction sitting in DKI Jakarta. If any provision of this Notice is held to be unlawful, void or unenforceable, then such provision shall be severable without affecting the enforceability of all remaining provisions. DIPA HEALTHCARE reserves the right to alter or delete materials from this website at any time at its discretion.